We had a really good BUSY Christmas! It was jam packed going from Tahoka to Lubbock far too many times to keep a person sane! haha Christmas Eve we had Christmas at my PaPa's house with my Mom's side of the family. Rilan and Miller had a lot of fun playing, I don't have any pictures of that christmas with me, they are all on my Mom's camera. Then that evening we went to Dax's parents house for dinner and to open gifts. I got a really cool coat from Banana Republic and then a new pair of sunglasses. Rilan got wayy to much, and wasn't really into opening gifts we made him try to open a few but he really just wanted to play with his trains. One thing he got that was really cool is a real electric guitar! He doesn't really like it yet but Daddy sure does! 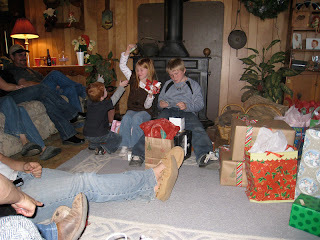 Then that night we went back to my Mom and Dad's house in Tahoka to spend the night hoping Santa would come see us there! Boy did he! Rilan made out with TONS of stuff. He was mostly just interested in all the Thomas stuff. He even got another better drum set, he got one last year too but it was very cheap and didn't like to stay up! So he is all fixed up in the music department! After we saw what Santa brought him my Dad had a surprise for him. 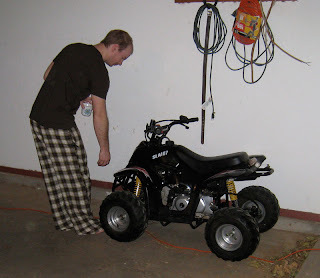 He got him his first REAL 4-wheeler! 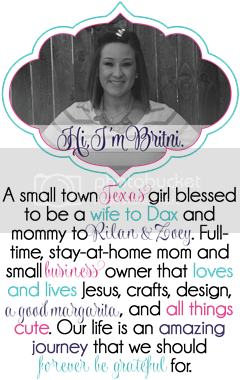 I think that Dax and I are more excited about it than him! haha Then for lunch we headed out to my Dad's parents house with the Engle crew! 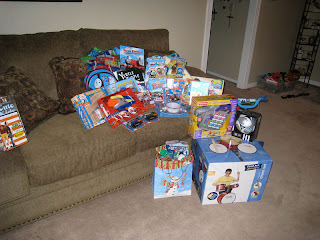 What a great time we had, we ate lunch and then opened all of our gifts. We always to a chinese christmas thing, where we draw numbers and then steal each others gifts. This year I got a really cook crock pot and Dax got a lamp that he was wanting for work. But I made him let me keep the new one at home and made him take one of our old ones to work! Rilan got a Vtech VSmile Pocket from Bayle and then we got our usual money from my Grandparents and Rilan also got 2 dirt bikes that he LOVES to play with. That afternoon was spent out on the track with lots of dirt bikes and the mule. We actually were able to get Rilan on the mule and ride it. Then that evening we went back to Dax's parents for dinner and to spend a few nights with them. The end of the week didn't go quite as well as the first. The next morning Rilan woke up not in the best mood, so Dax's dad wanted to take him to eat "bachi rice" thats what Rilan calls the Japanese Steak places. So off we went, Rilan didn't eat a thing and just wanted me to hold him, NOT like him at all. So I started feeling his head and he felt like he might have a little fever. We got back to the houe and I checked it sure nough he did. It was only like 100 at this point so I put him down for a nap hoping he might feel a little better when he got up. No such luck it was only worse, it had got up to about 101. That evening we went to see a friend of Dax's that lives in NY and was in town for the holidays. we were gone for about an hour. When we got back I was going to check his fever again and Dax's mom said she had done it about 30 minutes ago, and it was 98 or so, I was like well I will check it again to make sure its gone. I checked it and he was 103.2!! I freaked to say the least! He wasn't having any other symptoms but his fever so I had no clue what to do. 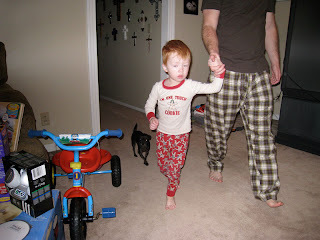 The next morning I decided if he still had a fever to take him to Urgent Care. He still had a 103 fever when we got up so off to the Dr. we went. On the way I wasn't feeling well but thought I was just because I hadn't eaten anything. We got there and they told us that he had a ear infection in both ears and a mild throat infection. So he gave him a prescription for Amoxicillin and we were on our way to fill it. We ran to get him something to eat while they were filling it and I started feeling even worse. While we were in line at Walgreen's I told Dax to hurry and make a MAD dash back. I ended up getting a freaking stomach bug that was going around. I literally felt like I was dying, it was horrible. So that evening, I thought I could make it to my parents house before I needed to be back in a bathroom, so we loaded up and were on our way. Rilan sick as can be and me feeling horrible too. Poor Dax was a trooper taking care of us. I finally started feeling better in the night and woke up feeling much much better. Rilan's fever was finally down some. That morning we loaded everything up and came home. My mom came with us so that was a HUGE help, plus we needed her car to so we could get everything home. Well sorry for this novel. If we wouldn't have gotten sick it would have been much shorter! Hope all of you had a great Christmas and a wonderful New Year!! Rilan trying to steal Reese's money! 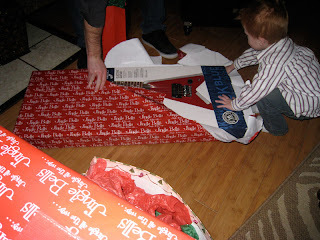 Rilan opening his electric guitar! Dax and Rilan on Christmas morning, coming to see what Santa brought! I'd say Santa was pretty good to him! i love the NEW pic well and your christmas card! 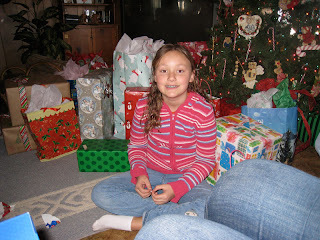 I am glad you guys had a great christmas!!! We should be sending out the invites the beginning of february so check your mail around then!!! It would be great if ya'll could come down, it should be fun! I can't believe how big Rilan is. He is such a cutie. Your new picture is so great!